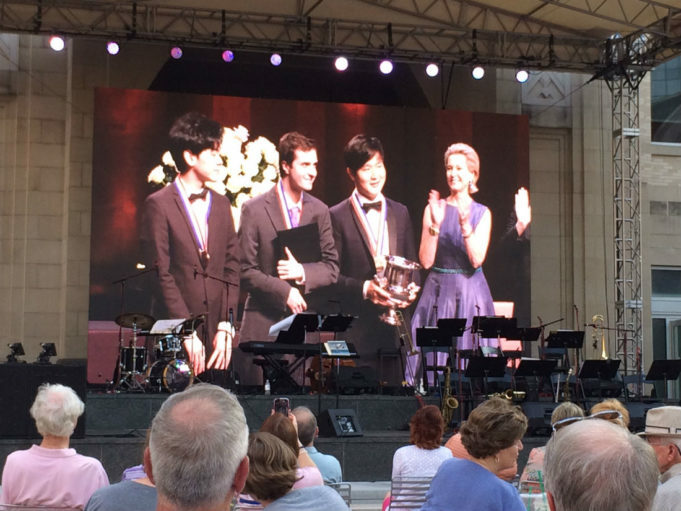 A crowd at Sundance Square watches Daniel Hsu, Kenneth Broberg, and Sunwoo Ye-kwon receive their medals at the Van Cliburn Competition. This year, the awards ceremony for the Van Cliburn is being broadcast live in Sundance Square, and I’ve decided to watch it from there. Adonis Rose and the Fort Worth Jazz Orchestra are making very relaxing sounds. They vacate the stage for the awards ceremony, but they leave their instruments and music stands, which partially blocks the view of the screen. I guess that makes sense, since the band will have to go back on, but it’s a little bit annoying. Well, the reasonable-sized crowd gathered doesn’t seem to mind. I’ve been inside the hall for these ceremonies, and unless there’s a screw-up of La La Land-at-the-Oscars proportions, it won’t be appreciably more dramatic in there. Fred Child takes over the hosting duties from Christina Allen and steals my joke by claiming that Steve Harvey, Warren Beatty, and Faye Dunaway will crown the champion. Just as I suspected, I would have been wrong if I’d picked the winners. South Korea now has its first gold medalist in this competition, and from the quality of musicians that has been coming out of that country, you’d have to say this was coming. I’m glad at least that the two Americans got on the podium, and I’ll going to look forward to hearing more from Hsu and Broberg. I’ll also look for other competitors to come back to us in 2021. In previous years, the after-party was at the Renaissance Worthington Hotel, but this year it’s going to be in Sundance Square, which strikes me as much more democratic (though not entirely; the VIP section will be inside Bird Cafe). Before I go off to join the party, I’d like to say thanks to all of you who took time out to read my blog posts about our city’s piano competition. I hope you all had an even better time reading them than I had writing them, and hope to meet up with you at the next Van Cliburn Competition. I had a great time reading your well crafted daily entries, which were far better ( more interesting musical detail and analytically aimed at a wide curious audience)–accented with better composer historical portraiture and city-scene art effects–leading to a full sensory experience! (as opposed to reading the deadly dull local daily newspaper accounts). I think that your instincts are good and I have enjoyed your accounts of this competition since 2013. I really think that you and the brave youthful competitors do more to revive interest in “classical” music (including 20th and21st Century pieces), than any of the “esteemed” critics at the local news level (who, in my opinion are so smugly caustic as to diminish its appeal). Having said all of this, however, I have the uncomfortable feeling that there are politics at play in all of these international competitions. I personally liked Broberg and felt that he should have medaled–I thought Gold. I just did not get the appeal of Hsu to so many of the judges. Seems like very talented Italians are too frequently left out of the finals at Cliburn (with the exception of Rana in 2103). No offense tot the talent winner– South Korea is a huge market-do the judges, whose livelihood depends on commercial success unintentionally factor this? Also no offense to Cheung, who is the most appealing candidate of Chinese descent ever in this competition (IMO), but it seems like she was more a decorative afterthought. (We actually had one rather obscure Chinese mainland contestant who had a teacher as a judge–and made it to semis much to independent expert chagrin,as I recall–fairly recently–She’s gone and he’s gone-btw) The Russians are ALWAYS good to great– but the message here may be that the audience is getting tired of being bludgeoned with Prokofiev (although we all acknowledge that his concertos are harder than h#ll to play ). Liberal America is rather down on the Russians at the moment. Enjoyed your reviews, well done.